Austral Precast Delivers Innovative and Environmental Precast Solutions to GroundBreaking Perth Development Halo on Mount. Australia’s leading manufacturer of precast concrete walling and flooring solutions, Austral Precast, has partnered with Baltinas Architects for Perth’s latest innovation in sustainable residential housing, Halo on Mount, helping to resolve some key design and environmental challenges. Located on the city’s doorstep in one of the most sought after sights locations in Perth, the new landmark combines cutting-edge, contemporary architectural design with environmental efficiencies to set a new benchmark in urban living. The development, which comprises 21 apartments, two penthouses, and a café, has been designed as a sustainable, timeless architectural statement, responding to cues from its parkland surroundings on Mount Street. 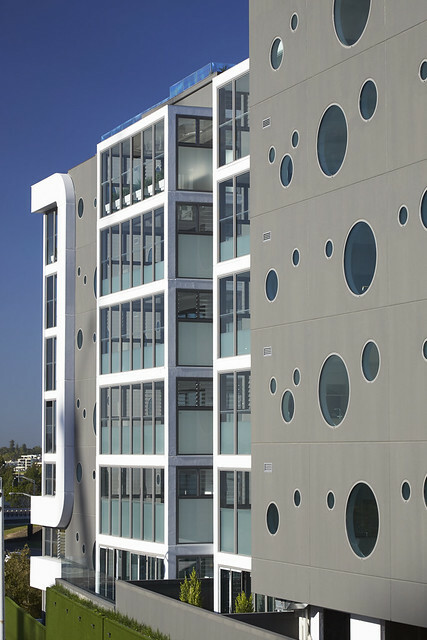 Meanwhile, the development’s unique façade of halo circular windows draws on the dynamic Perth cityscape, creating an ever-changing pattern of light and shade. The complexity of the façade presented a unique design challenge, demanding the highest level of engineering skill for the design and manufacture of the precast mould. 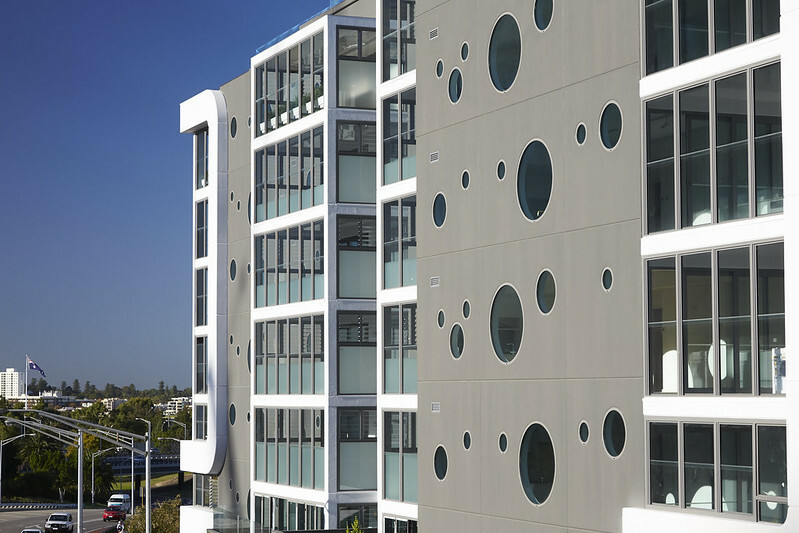 Baltinas Architects drew upon the expertise of the Austral Precast WA team, who engineered an innovative precast solution which creates a seemingly random pattern of circular openings on the façade while using a standard mould for repetitive casting. The panels were manufactured from an exposed organic grey, black and brown aggregate mix, resulting in an enduring, natural look. They were then sealed in their natural form to prevent the need for ongoing maintenance that is often required with a painted façade. Sustainability has been a key principle underpinning the design of Halo on Mount. Every aspect of the nine level building, from the solar panels and self-generating power to the use of rainwater tanks and low emission construction materials, have been considered to enhance sustainability performance. From a building perspective, the use of precast panels also has the added benefit of helping to mitigate construction risk by taking work off site where a project’s risk profile can be better managed. Off-site work also means the precast panel is produced under strictly controlled conditions in factories, resulting in better quality, accuracy and durability. Precast elements can then be scheduled to arrive ready for installation and lifted directly into place, to dramatically reduce construction time. Due to its positioning along the Mitchell Freeway, noise reduction was also a major consideration in the design and choice of building materials for Halo on Mount. The same thermal mass that contributes to the sustainability of precast concrete also makes it an excellent sound insulator, reducing the intrusion of external noises into internal living areas. 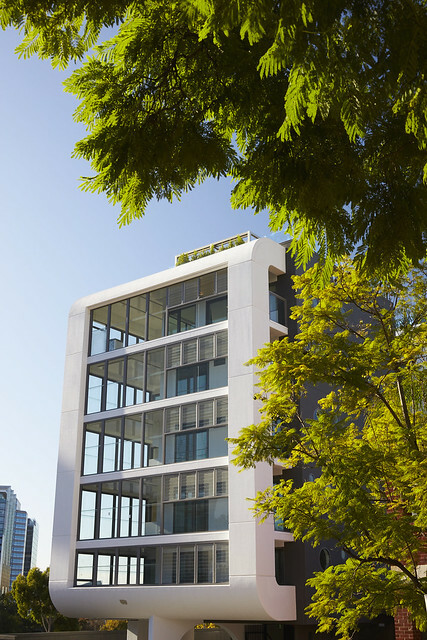 In addition, the tolerance for windows and doors at Halo on Mount are tight to prevent higher noise levels in the units, and precast has better control over tolerance than insitu construction. Commenting on the new development, the State Manager at Austral Precast WA Peter Smith said, “Halo on Mount is a world-class, environmentally sustainable building and an exciting addition to the City’s west. The development provides an important example of how innovative, contemporary design coupled with cutting-edge technologies and environmental strategies can merge to create an architectural development not only of great visual complexity, but outstanding functionality and sustainability. 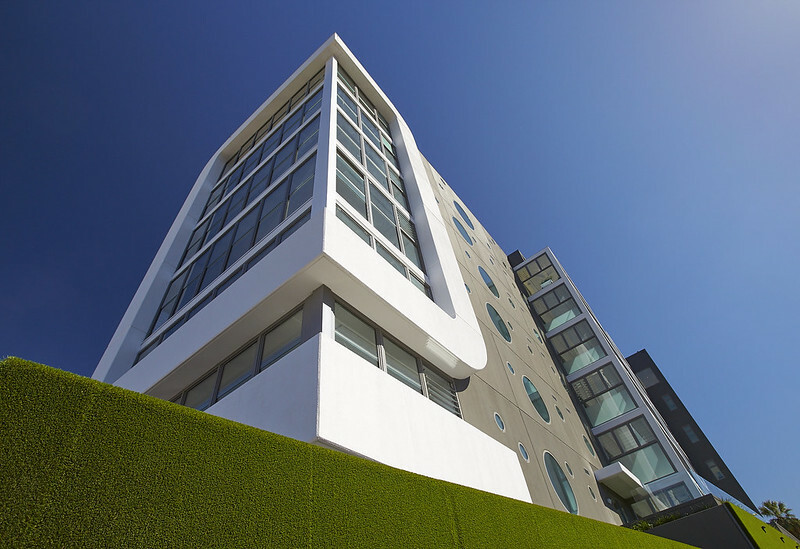 Halo on Mount truly sets a new benchmark for Australian residential design excellence. Austral Precast is proud to be involved in this landmark development, delivering our uniquely designed precast concrete solutions to meet the high standards of design, functionality and environmental sustainability set out by Baltinas Architects.